Avatar is No Matrix, but still a "Must See"
It amuses me how the news keeps reporting how much money Avatar is pulling in. 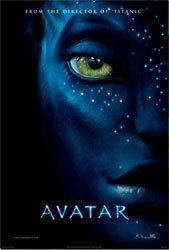 A ticket for an evening showing of Avatar at my local multiplex is $14. This obscene price makes the total box office a little meaningless doesn't it? If you consider that Star Wars brought in $798 million, then the $429 million that Avatar has brought in after 4 weeks isn't too impressive. World wide there must be thousands of more theaters than there were 30 years ago and when you adjust for ticket prices (A little bit of research shows that the average ticket in 1977 was a little over $2), Avatar would need to bring in more than 4 and half billion dollars to be as popular as the original Star Wars. So until the news starts reporting the total ticket sales or adjusts for differences in price, I'm going to keep ignoring the gross sales. As for the movie, the story was a little lacking (which apparently Cameron tried to make up for with length) but if you can get through slow pace and the unbelievable setup in the first hour, then you can sit back and enjoy the last hour and half. The is nothing mind blowing about this story like we saw in The Matrix, but the special effects are simply amazing. I saw it in 3D which looks amazing most of the time, but also hurts my eyes in others so while I can do without that, the computer animation is simply believable (not unbelievable like in the aforementioned Star Wars. You can't tell where the actors end and the computer begins. It is expensive, but this is a movie you need to see on the big screen. This page took 0.217 seconds to load.